Artform Plastering - Plasterer based in Rossett, Clwyd. 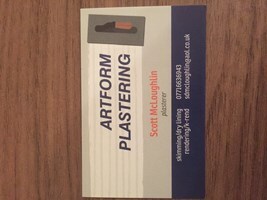 Hi I'm Scott McLoughlin sole trader of Artform plastering. I have been a qualified plasterer for over 18 years, we specialise in all types of plasterwork.